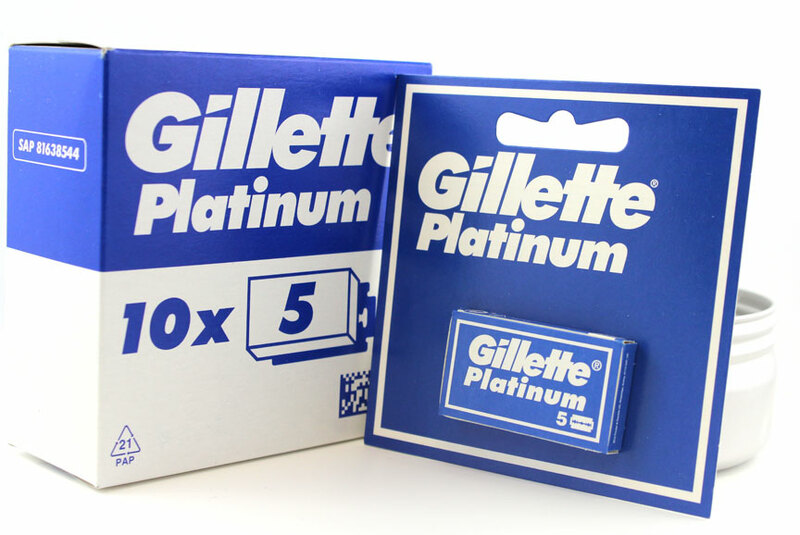 I just received shipment of Gillette Platinum blades from the St. Petersburg factory in Russia. Supposedly these are the same exact blades as the legendary "Gillette Swedes". Smooth, sharp and comfortable, pick up some new classics today. Sold in boxes of 50 blades (each box contains 10 cards of 5 blades). Nice! I know guys who love these blades. Do you know anyone selling them by the tuck? Maybe tryablade? 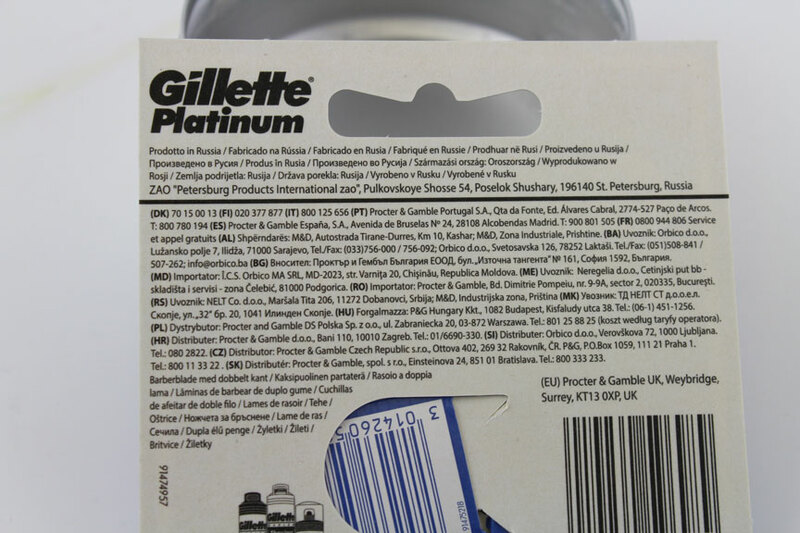 I see that they carry Gillette Platinums made in Russia but the label looks different. My favorite blades is the Gillette Platinum from St. Petersburg, and come in a different package but must be the same. Never tried the Swedes but if they performed like these do, I understand their reputation. Yes smooth, comfortable and sharp. And consistent. Never a bad blade and I've used hundreds. (04-06-2019, 02:13 PM)churchilllafemme Wrote: What does the back of the card look like? This image is a little blurry but, should give you an idea. Are these the same blades? These are available on tryablade and are made in Russia. But the packaging is all different so I'm guessing no? (04-06-2019, 06:12 PM)MntnMan62 Wrote: Are these the same blades? These are available on tryablade and are made in Russia. But the packaging is all different so I'm guessing no? No, I don't think they are the same but, I could be wrong. I used to carry these blades for awhile too...maybe 5 years ago or so. It may just be different packaging -cards of 100 versus boxes with 10 individual cards. Its a bit of a mystery. That is true but a thread I have been reading on B&B suggests that these blades are better than the blades by the same name in different packaging. Talk about going down the rabbit hole. Interesting thread. Thanks for posting the link. I read through most of it but didn't click on any of the links. I did not see anyone comment about or make comparisons between these new blades, I'll call them Swedes, and Gillette Silver Blues, my current favorite and also made in Russia. Anyone have any thoughts or experience comparing the Swedes against the GSB's? I'll also ask another question. Are these blades worth more than twice the price of Gillette Silver Blues and 5 times the price of Voskhods? Or twice the price of Polsilver SI's? I'm intrigued and would consider snatching some up but either need to hear from someone who has shaved with any of these I've mentioned to compare or I need to be able to try a tuck or two to test them out before buying in larger quantities. I am easily subjected to AD's and blades are no exception. But I do have a nice stash of blades and don't really "need" anymore for now. But "need" has never been the motivator in this great hobby, is it? It's the "want" or "crave" that motivates us. Thanks to Bullgoose the Enabler for feeding my "want" and "crave". Those are the ones frequently found in brick-and-mortar stores here in Portugal. Even in some supermarkets they can be found. Made in S. Petersburg, they are great stuff indeed, and considered a top shelf product by many people, although somewhat expensive when compared with other brands. Just had a couple of shaves with it an am very pleased. Smooth and sharp. I've had 2 shaves as well. After 2 shaves I have put the Gillettes in all my razors I used Feathers in. I have used these in mild to moderately aggressive razors, and for me they are not as smooth as the vintage 'Swedes,' nor do they last as many shaves before starting to dull and drag.